In August 2003 the press reported the discovery in England of the statue of a Roman legionary wearing socks under his sandals. Romans were blamed by the BBC for having introduced in Britain this appalling example of bad taste (especially when the socks are of a contrasting colour e.g. light blue socks with dark sandals). This page deals with some aspects of the representation of feet and footwear in antiquity (socks are rigorously banned). According to anatomists three quarters of the population have a so-called Egyptian foot which is characterized by a great toe longer than the second toe, 1/6 of the population have a so-called Greek foot where the great toe is shorter than the second toe, while the rest of the population have a square foot where the great toe has the same length as the second. The reference to Egypt is due to the fact that in Egyptian paintings (where usually feet were shown from a profile point of view) the great toe appeared longer than the second toe. The reference to Greece is due to the fact that Greek statues showed feet having the second toe longer than the great toe. 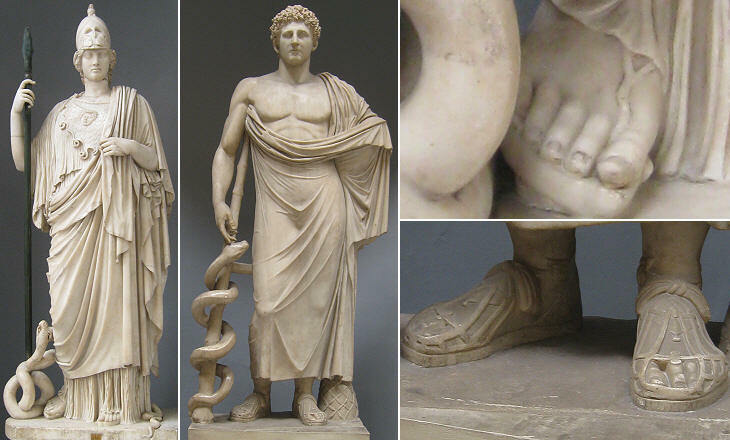 Notwithstanding the prevailing anatomy, nearly all the Roman statues, often copies of Greek originals, have Greek feet. It is not easy to find a statue with an evident Egyptian foot, because even Egyptian statues have Greek feet. Anyhow maybe by chance, maybe on purpose the colossal statue of the Nile in Piazza del Campidoglio was restored by replacing its lost foot with a distinctly Egyptian foot. Neoclassic artists had such an admiration for Greece that their statues have Greek feet bordering deformity. Rinaldo Rinaldi, a scholar of Canova, provided a perfect example of this tendency in his statue of Faith in S. Marcello. Greek gods as a rule were portrayed barefoot even when they wore elaborate dresses. However there were some exceptions: Diana, the huntress goddess, wore proper footwear, and often other gods portrayed while hunting were not barefoot. The presence of snakes maybe influenced the decision of providing both Athena and Aesculapius with a means to tread on them (in case of need). While Aesculapius has stout sandals, Athena has a much lighter model. Roman Emperors, especially for their eastern subjects, promoted themselves as having a divine nature. 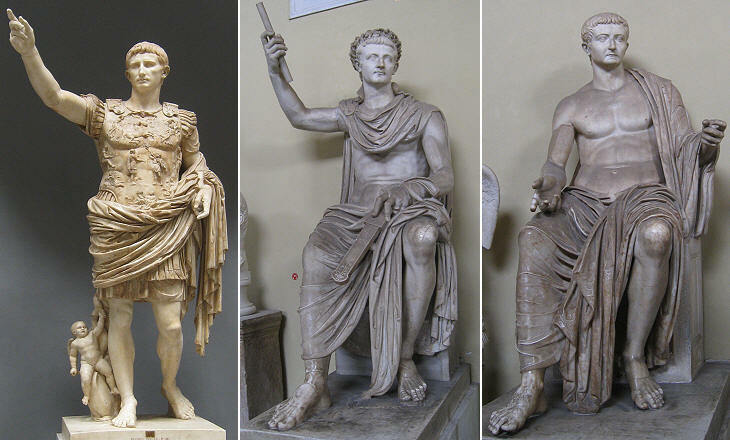 Augustus paid a lot of attention to his own iconography. In the statue shown above he is portrayed wearing an elaborate cuirass over an even more elaborate toga, but barefoot. 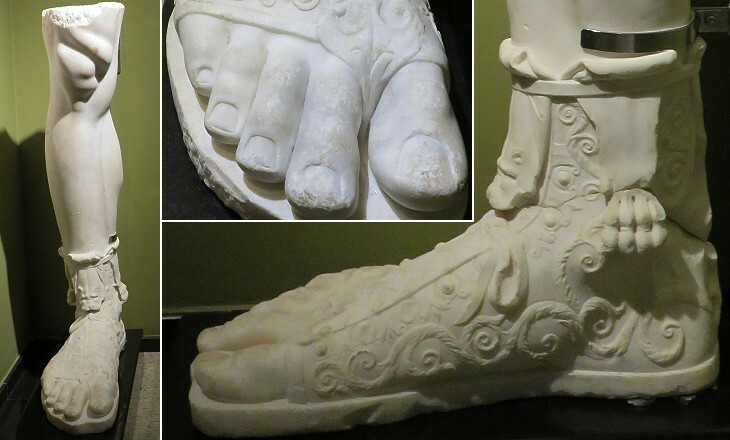 To the eyes of a today's western viewer who associates being barefoot with being uncivilized, the feet of Augustus do not seem to match the rest of the statue. But walking barefoot was a privilege of the ancient gods, who clearly were not affected by thorns and scratches. The association between being barefoot and having a superhuman nature influenced also Renaissance and Baroque artists. Michelangelo's Sibyls and Prophets in the Sistine Chapel are all fully dressed, but at the same time barefoot and Bernini's Santa Teresa is barefoot too. Notwithstanding the fact that gods and emperors were usually barefoot, there are enough examples of Roman footwear to say that Ferragamo and Gucci and in general the good design of Italian shoes have very ancient roots. 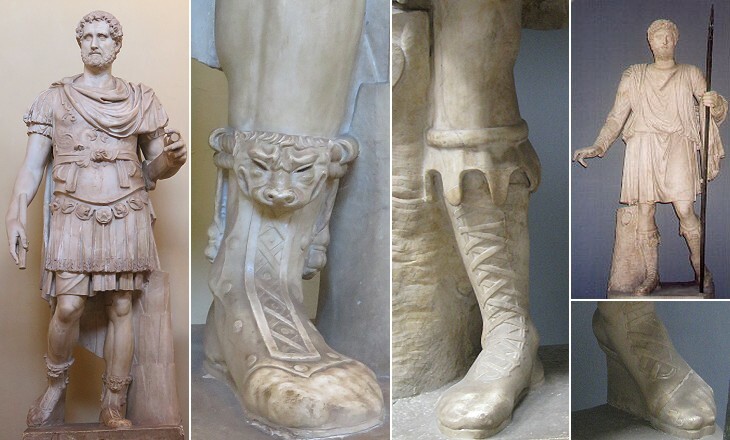 Roman military and hunters could parade with elaborate boots (note: the statue of the hunter has a head belonging to another statue). Recent archaeological excavations at Sagalassos in ancient Pisidia (south-western Turkey) have unearthed the right legs of two colossal statues of Emperors Hadrian and Marcus Aurelius. They provide a very accurate depiction of the elaborate footwear of an emperor. Sutor, ne supra crepidam (Shoemaker, not above the sandal) is a sentence by Apelles, the famous Greek painter, telling a shoemaker (who after having made a correct observation on how Apelles had painted a sandal, wanted to advise on other matters), not to talk about things he had no knowledge. The anecdote was reported by Plinius and the sentence became very popular. The images above show maybe the most celebrated sandals of the Vatican Museums belonging respectively to the Apollo del Belvedere, a Roman copy from a Greek bronze original, perhaps the ancient masterpiece which Renaissance artists admired most, and Perseus a statue by Antonio Canova which replaced the Apollo del Belvedere when this statue was taken to Paris by Napoleon in 1800. Canova's Perseus, notwithstanding the different subject was inspired by the Apollo del Belvedere. I wonder if a shoemaker would not have advised Canova about the sandals of Perseus being fitter for a dancer than a warrior. Another comparison between ancient and modern sandals is offered by the statues of Marcus Aurelius in Piazza del Campidoglio and Bernini's S. Longino in S. Pietro. The sandal of the Roman emperor shows that the sole is held only by a couple of straps. As I had some doubts on this design I checked on other statues and I found that actually this kind of sandals had only one couple of straps holding the sole. Bernini had surely in mind Marcus Aurelius' sandals in the design of S. Longino, but he preferred to provide the Roman centurion with a sandal with two couples of straps, thus ensuring a firmer adherence of the sole to the foot. Many ancient reliefs showing fights often portrayed one side barefoot and the other not. In the relief showing a battle between the Greeks (lead by Achilles) and the Amazons, nakedness is a sign of superiority, while in the relief showing Romans and Germans the superiority of the former is enhanced by their being fully dressed and wearing boots. The detail above shows an example where toes add to the emotion expressed by fingers. By compressing our toes into closed shoes since childhood, we definitely curtail our personality!